I knew the trick for clean and soft feet, since a long time. But never really felt interested in trying it. I always suggested it to my mom, and other girls who asked me. But today, I did that trick myself, and to my surprise, it really worked! 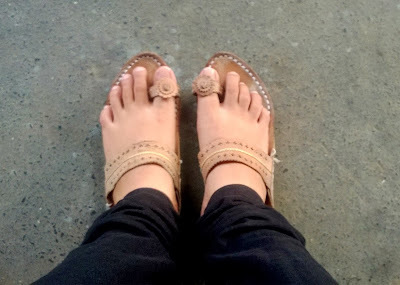 My mom loves my feet, and says that she used to keep staring at them when I was a new-born. But, except for the shape, my feet sucked, nowadays. Today I had a traditional event at my college, so for the support, our student coordinators had asked us to go traditional today. So I had worn a pretty off white kurta with red, black and golden print on it, with black leggings and Kolhapuri Chappals, and a handbag with small mirrors all over it (check out my Instagram account for the photos). No matter when I wore a traditional pair of slippers/shoes, my feet looked ugly, always. So this time, I made it a point, to use my TRICK, before getting into my Kolhapuris. And finally the trick is: Applying Moisturizer on the feet. Applying it really makes your feet look soft, like babies'. Plus, the moist on your feet prevent the dust accumulation. Sometimes while you travel by a local train, or by a crowded bus, people tend to stamp your feet. This is the main reason for the uncleanliness that you see on your feet. Moisturizer is the only way out. I tried it today, and I might just apply it daily (if I remember it in the mornings!). A small trick, but so much to write. Ha! What do you do to prevent feet-darkening?